Investment advisors are increasingly concerned that the buy-and-hold strategy may not work well going forward. After a seven-year bull market, stocks in 2016 reached the highest valuation since 2000 by several measures, while earnings for the S&P 500 are declining (see our blog for the latest updates). U.S. economic numbers have deteriorated in 2015-2016, and with the Fed preparing to hike interest rates, long-term bonds may present significant risks. In addition, because most investment markets appear to be overextended at the same time, traditional diversification may not mute portfolio downside well – as it didn’t in 2008. Advisors and asset managers are turning to tactical management to supplement the traditional buy-and-hold, strategic asset allocation approach. Tactical asset allocation is a form of active management, just like security selection – see how it fits in the established CAPM/MPT framework. Traditionally, tactical management tends to use one of two approaches: trend-following or sector rotation – both largely based on technical indicators. Research has shown that the market is somewhat efficient, and such price-based technical indicators carry little information. Thus, such simplistic approaches can hardly work consistently over time. It is well documented (including the excellent book by Grinold and Khan) that rational investors must consider forward-looking expectations of returns and risks – active management means forecasting. Therefore, tactical investing must optimize near-term risk-return forecasts for major asset classes (equities, long-term and short-term bonds, cash, etc.). 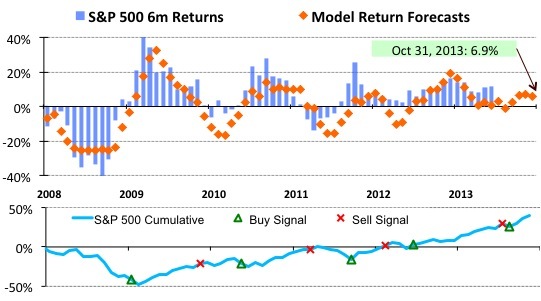 At Model Capital, we use near-term return forecasts for major indices (such as the S&P 500) produced by a consistent statistical forecasting model (not a set of disjointed indicators). Our tactical asset allocation model uses multiple fundamental-type factors that fall into Valuation, Economic and Market categories. Having the model’s return forecasts, we then allocate our tactical portfolios to the asset class(es) with the best return-risk combination in a straightforward, judgement-free process. We produce our Tactical Strategies report for clients twice a month. It contains the latest U.S. equity market forecast by our model, the fundamental factors that drive it, and the recommended tactical portfolios. Please provide your information below to receive the latest report.